Between October and mid-December 2017, I did simple "deep-sky autumn observations", mostly with binoculars, which might be of interest to other beginners and are therefore described here. I selected the observation objects primarily on the basis of my literature (see references). My observations ranged between the coming Orion in the East to Hercules in the West. I mostly "hunted" for objects that can be observed with binoculars. Observations started early and the sooner, the later it became in the year. At the beginning of November, I also observed after midnight with my binoculars. In general, the sky above Mühlhausen/Kraichgau is "light-polluted" and does not invite you to search for deep sky objects. This is certainly one of the reasons why I found some of the deep sky objects that I wanted to observe only sometimes or not at all. When looking for deep sky objects, a good preparation is mandatory - you can read this, and I can confirm it. "Good preparation" basically means that you compile a list of the objects that you would like to observe, and to find out where and how the objects can be found. Is it it or not? If you point your telescope with the help of the red dot finder approximately to the desired sky object, look into the eyepiece and see nothing or only "nebulous clouds," but not something that resembles the object in question, the question arises: Is the sky too light-polluted that I can recognize the object or does the telescope point in the wrong direction? Admittedly, I was - even after repeated attempts - not able to clarify this question for some of the objects that I tried to observe manually. 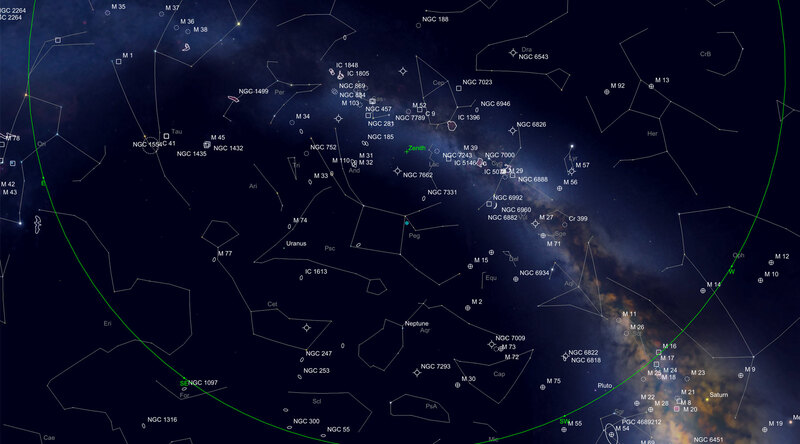 All the star maps were created with SkySafari Plus for Apple Macintosh.